Write to us - we want to hear from you! Send your comments, questions and concerns. Submissions chosen for publication may be edited for length or clarity. "Hi Jenny. On a daily basis you amaze me! The buns are so lucky to have you! Cant wait to see my guys and all the others and meet the new additions on saturday. It cant get here soon enough! Pleas again let the kids know I love them and miss them and thanx for taking such good care of them. They and I are blessed to have found you!" "I would be willing to foster bunnies in my home to help. I have had bunnies my entire life since I was about one, so I do have extensive knowledge when it comes to their care, needs, and even training. I was looking for a bunny myself but fostering until they find good homes is something I'd love to do." ​"I just wanted to say Thank You. When I first saw this page, I actually cried tears of joy. There are no words to describe how great it is that there is a place in Maine that is rescuing rabbits. 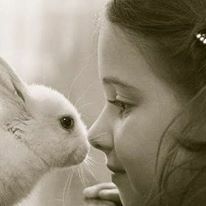 I am a rabbit owner and the thought of such wonderful animals suffering just breaks my heart. It's just good to know that someone else cares. Rabbits are animals that seem to be overlooked all the time. Thank you!"